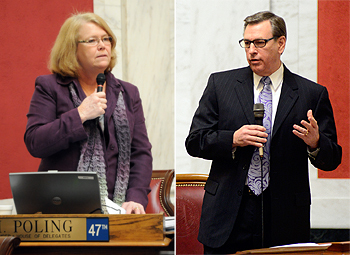 The 2013 Regular Session of the 81st West Virginia Legislature has been dominated by talk of public education in West Virginia and the reform of the educational system. Much of that talk has been driven by low national rankings in relation to student achievements as well as deficiencies within the structure of the Department of Education which were highlighted by an educational audit taken last year. Lawmakers undertook the task of examining and debating the original bill which was introduced first in the Senate. Throughout the committee process, this issue was discussed, weighing the pros and cons of each provision, with members from both the House of Delegates and state Senate as well as the various stakeholders who all share a common interest in improving the delivery of education in West Virginia. After weeks of arduous committee work, revisions were made to the original bill which have made this piece of legislation a collaborative work with wide ranging support from members of both bodies. Under changes made and approved by the Legislature, this compromise allows for school principals and faculty senates at individual schools to have a say over teacher hires with their recommendations receiving double weight among 11 factors used to fill teaching jobs. Additional factors for consideration during the hiring process include seniority and whether prospective teachers have a certification from the National Board for Professional Teaching Standards. The initial, introduced bill proposed changing state law so county school boards could offer a “balanced” or year-round calendar. Current state law now limits the school calendar to 43 weeks. The revised bill up for passage now increases the yearly school calendar to 48 weeks, providing more flexibility to local school boards on how to schedule their school years which could include year-round calendars. Another provision under this revised bill will no longer require state school superintendents to hold a master’s in education administration with the thinking behind this change being the potential of increasing the national pool of applicants for the superintendent’s post. Other provisions in the bill would provide elementary school teachers with specialized training designed to increase the number of third-graders who end that year reading at grade level and make possible for full-day pre-K programs to be available to 4-year-olds statewide. Also, this bill will no longer allow the nonprofit Teach for America program to operate in West Virginia, a controversial provision when the bill was first introduced.. Instead, the Legislature plans on studying programs such as this to determine their feasability in West Virginia. The 2013 Regular Session is more than halfway over but as this bill highlights, legislation works best when lawmakers, concerned citizens and stakeholders work together on compromises with the goal of a better West Virginia in mind for all. Senate Bill 27 relates to the administration of opioid antidote in situations of emergence. This bill would allow for police, fire and emergency service providers, to carry Naloxone for the purpose of administering it in suspected narcotic drug overdose situations. Senate Bill 108 would create an Unintentional Pharmaceutical Drug Overdose Fatality Review Team. Senate Bill 159 would create the Uniform Real Property Transfer on Death Act. This would allow the owner of a real property to pass on property directly to the inheritor upon the death of the owner without probate. Senate Bill 183 would update the terms in the Corporation Net Income Tax Act. Senate Bill 353 would establish the First Informer Broadcasters Act. Senate Bill 358 would make technical corrections, clarifying that the oversight board can look into any actions or practices done by municipal pension funds that could put the security or fiscal integrity of the funds, adds a liability disclaimer, revises the refund section at risk. It would also make clear that the military service credit does not allow a member to retire before age 50. Senate Bill 368 would clarify that certain criminal convictions would constitute as enough reason to void a marriage. If the other party is not aware that their spouse has been previously incarcerated, they may institute an annulment. This can only be done if the spouse was incarcerated more than one year before the marriage. Senate Bill 383 would allow for family court judges in family court contempt cases to designate counsel if the financially restrained offender it sentenced to serve time in jail. Senate Bill 412 would require that supervisors of conservation districts be removed from office in the same way in which other positions of elected county officials are removed. Senate Bill 427 would clarify requirements for certain motor vehicle searches. It would clarify the current law concerning the section of when an officer stops a motor vehicle for an alleged violation of a traffic misdemeanor law and could search the vehicle. Only one of the three subdivisions within subsection (a) must be present. Senate Bill 441 relates to the withdrawal of false state tax liens. It would provide a means for the withdrawal of these liens that have been filed prematurely, inadvertently or erroneously. Senate Bill 464 would regulate tanning facilities by placing a ban on tanning bed usage for anyone under the age of 18. It also requires facilities to secure a business registration certificate by July 1, 2013. They would also have to register with the local board of health, have inspections and obtain an operating permit before starting their business. Any violators of these provisions will be penalized. Senate Bill 446 would maintain conformity with the international fuel tax agreement. Senate Bill 477 relates to the electronic registration of voters. The bill would allow for a person to type their information in a secure electronic registration system by inputting their information and transferring it, along with their signature, to the Secretary of State and the relevant county clerk’s office. Senate Bill 563 would exclude platinum, gold, silver and palladium from being defined as “scrap metal”. Senate Bill 572 would amend the procedures related to payment of claims. Senate Bill 553 relates to the Highway Design-Build Pilot Program. It would continue the law which expires under current law on July 1, 2013, to mid-2018. Senate Bill 546 would require that the appointment of the State Superintendent of Schools be with the consideration and approval of the Senate. House Bill 2351 would authorize officers to arrest a citizen driving on a revoked/suspended license and present that person to a magistrate. If the magistrate is not reasonably available, the officer may charge by citation instead of prompt presentment before a magistrate. House Bill 2361 would clarify the definition of an “eligible veteran” for certain state training and employment preference benefits. House Bill 2414 would allow municipalities to convey property to a nonprofit for a specific public interest as long as it benefits the municipality. House Bill 2497 would make applicants for real estate licenses to pass criminal background checks. House Bill 2553 would permit the Secretary of State to dissolve a limited liability company, a corporation, a nonprofit corporation or a foreign corporation corporate entity if a necessary professional license has been revoked or the entity is in default with the Bureau of Employment Programs. House Bill 2579 would alter the enforcement procedure for selenium within two months of the effective date this bill becomes law. The selenium criteria would now become a threshold standard that once a permit exceeds this level, the operator would have to begin monitoring impacts to fish populations. The monitoring results would be reported to the DEP for future use as a selenium state-specific standard. The West Virginia Water Research Institute at WVU would assist in developing this new criteria. House Bill 2603 would clarify the Domestic Violence Act by revising and adding definitions. The bill would also add members to the Family Protection Services Board, set procedures for hearing and appeals, and many other revisions. House Bill 2729 would allow West Virginia schools (public or private) to possess and maintain a supply of epinephrine auto-injectors (epipens) at the school for emergency care or treatment of anaphylactic reactions. House Bill 2747 would clarify certain terms in relations to meetings of state agencies. Also, the bill would clarify the process in which a state agency would announce its meetings. House Bill 2760would establish a statewide regulation of firearms, ammunition, and firearm accessories. The bill would remove references to regulation of firearms by counties and municipalities. It would also voids and nullifies the effectiveness of any previously grandfathered gun or firearm regulation enacted by a county or municipality which is contrary to or not authorized uniformly in the state code. House Bill 2764 would extend additional authority and duties regarding school attendance. House Bill 2770 would permit dealers who sell less than 18 new or used cars to renew their dealer licenses. House Bill 2847 would clarify the current code relating to real property and personal property taxes collected by county sheriffs. House Bill 2861 would establish a program designated to help at-risk students in the public school system. The bill would allow a dual enrollment in the public school and the alternative program school if the county superintendent approves and several conditions are met. Education Chairs Mary Poling (left) and Robert Plymale (right) address their respective chambers about Senate Bill 359.